Innocent or guilty Her time is running out . . . The air is hazy and grey with gunpowder smoke. Everyone has been shot but me. I haven't got so much as a bruise . . . Maja Norberg has spent nine months in jail awaiting trial for a shooting in her school. Among those killed were her boyfriend and her best friend. Now the time has come for her to enter the courtroom . . . But is Maja a demonised victim - or cold-blooded killer? 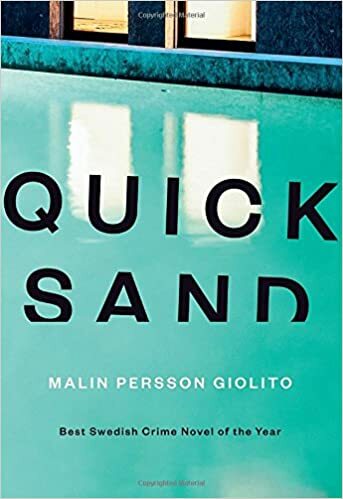 The opening chapter of Quicksand by Malin Persson Giolito caught the scene well for me. Maja is there in the classroom, the only uninjured person, with her boyfriend and best friend lying dead after a mass shooting. The main part of the book starts when Maja, having been in prison for 9 months, appears in the courtroom charged with murder and inciting murder. The story deals with the time before the shooting and the time after as well as the court case. The question is what really happened in that classroom. Various aspects about the case and issues surrounding it are gradually revealed. Initially I found Maja’s voice (and it is all told in her voice) rather “matter of fact” story telling which I initially liked. It was somewhat understated and equally had a feel of being uninvolved. A combination of that and the rather disjointed nature of the chapter content did make the book feel it lacked pace in the first half. For me the story became more interesting/compelling around half way through. The courtroom drama once it got going was good. Around this time the peripheral narrative dealing with Maja’s life leading up to the shooting seemed far more alive and relevant than earlier on. This is certainly not a book I would have given up on. Other than the lack of pace early on sadly none of the characters really appealed to me in any way and some really didn’t get me interested at all with the exception really of Samir.